SAVE ££ and get the Drymatic II with a Y-piece, Injection Drying Kit, and Exhaust Reducer Kit. Interested in buying this special? The award winning DBK Drymatic System was developed to offer the Damage Management industry a cost-effective tool that would cater for a broad range of structural drying requirements including floor drying and moisture removal. Enhance your experience with the 7 Port Adaptor Kit – turn your Drymatic II into a Push/Pull cavity drying system! 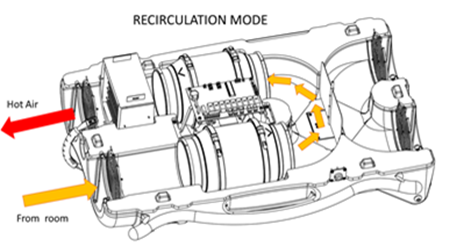 During re-circulation Mode the Drymatic II takes air in through the Room Intake, measuring Temp and %RH, and then reheats the air to help raise the ambient temperature within the drying chamber. The drying chamber is continuously heated up until either a user-defined Temperature (C/F) or Relative Humidity (%RH) limit is reached, or until the machine determines that the system needs to make a change based on rates of change within the drying environment. The Drymatic II uses re-circulation mode to maximise temperature gain, whilst minimising heat loss through the Exhaust process. In Exhaust Mode the Drymatic II takes air in from the Room Intake and purges it straight through the machine to outside via the Outside Exhaust - exhausting up to 595m3/hr of air. At the same time the machine takes in replenishment air from an unaffected area (e.g. outside air, air from an unaffected space, or process air from a HVAC system or dehumidifier) and heats that air before pushing it in to the drying chamber. The Drymatic II can autonomously cycle between the Re-circulation and Exhaust modes to maximize the amount of water removed from the area. Further enhance your Drymatic II experience! Turn your Drymatic II into a Push/Pull cavity drying system using our 7-Port adaptors and hose kit. Create Positive, Negative or Balanced drying regimes by manipulating the number of connections fitted. The Y-piece splitter allows you to direct your airflow into separate chambers from the Drymatic II. This Y-Piece allows you to duct the controlled heated airflow into 2 areas. The Exhaust adaptor allows the Drymatic II Outside Exhaust duct to be reduced from 150mm to 100mm which allows you to exhaust your Drymatic II into a smaller aperture, such as a letterbox, kitchen extraction fan, or air-vent. The Kitchen Kit gives you the ability to further reduce the size of your hose so that you can gain access to even harder to reach areas. The reducers drop the hose down from 38mm to 25mm and this is perfect for insertion into the base of kitchen cabinetry. Simply pop in a flush-mount vent cover when you are done.